I resolve to eat food I love! I thought I would go with a "healthy recipe" since we are all trying to get rid of a few extra pounds we put on over the holidays. At least I know I did. However, I refuse to eat food that I don't like just because it is supposed to be healthy. Luckily, I happen to like broccoli rabe and most vegetables. I think that is the key. EAT WHAT YOU LOVE and in moderation. I know it's not easy sometimes (especially because I LOVE COOKIES), but it does work if you try. Speaking of COOKIES, I have plenty of catching up to do with posting all of my cookie recipes. And they were awesome! So keep checking in. The inspiration for this recipe came from my friend Giada, of course. I changed some of the proportions and cooking times. Remember broccoli rabe is a little bitter, so make sure to boil it before sauting to remove some of the bitter flavor. The raisins offer a little sweetness to offset the bitter broccoli rabe. And of course, the pine nuts give a little crunch, which I love. Cook the broccoli rabe in a large pot of boiling salted water until tender, about 6 minutes. Drain the broccoli rabe reserving about 1/4 cup of the cooking liquid. Set aside. Heat the oil in the same large pot over low heat. Add the garlic and red pepper flakes, and heat until the garlic is softened and the oil is flavored, about 5 minutes. Adjust heat to medium-low. Add the broccoli rabe and toss to coat. Add the reserved cooking water, the raisins, and cook about 2-3 minutes. Season with salt, to taste. Just before serving, toss the mixture with the pine nuts. 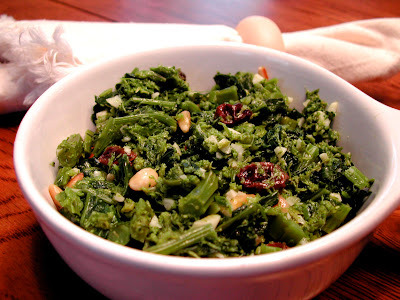 I've never had broccoli rabe but definitely want to try it! Look great...so pretty and green! Yes yes yes! I love everything in this dish. As long as I can get into my pants, I don't feel too bad...but they do feel a little more snug than usual. I really need to tone down the baking sprees. broccoli rabe is a litle different vegetablebut in the long run is very good and is very good for you.bambola.